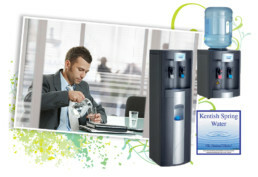 Our bottled and plumbed water coolers offer both ambient and chilled water to keep your staff and visitors refreshed. The bottled unit is completely manual with no printed circuit boards or solenoids, meaning total reliability. Fairtrade Vending have our own brand of 19ltr bottle spring water – Kentish Spring Water. We can supply bottled water coolers on a No Contract basis – we can also provide POU water coolers on a rental basis. Completely natural, pure bottled spring water.